Whole Foods: So Delicious Non-Dairy Coffee Creamer as low as $.85 each (reg. $2.49)- Stock up! 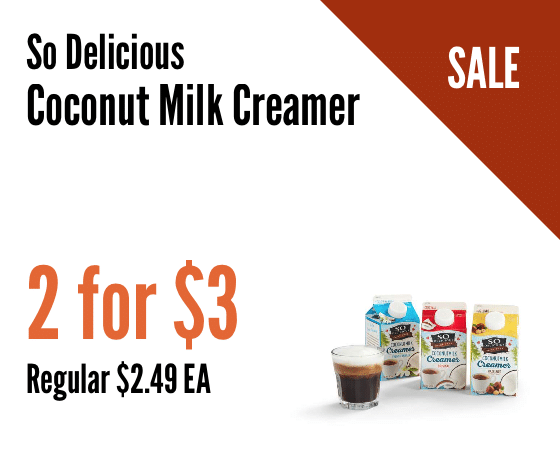 Coffee drinkers, head to Whole Foods this week for a super low price on So Delicious coconut milk, non-dairy coffee creamers! There are a bunch of coupons below that you can use with this sale, so you can really stock up! Whole Foods offers a 10% off discount when you buy a case (usually 12), you could score an even lower price if you stack that discount with the coupons. I know their milk usually has an expiration date a few months out, so I’m thinking their creamer should too. $10.20 after coupons and 10% case discount, so just $.85 each!